“I can only describe the Montessori influence upon my daughter as inestimable. Her “loving to learn” and her respect for learning are a direct result of her time at The Montessori School. There is never a moment when I haven’t recognized the influence of Montessori on the culture of our family, but most often I see it when my daughter and I are talking about a book, play or film. 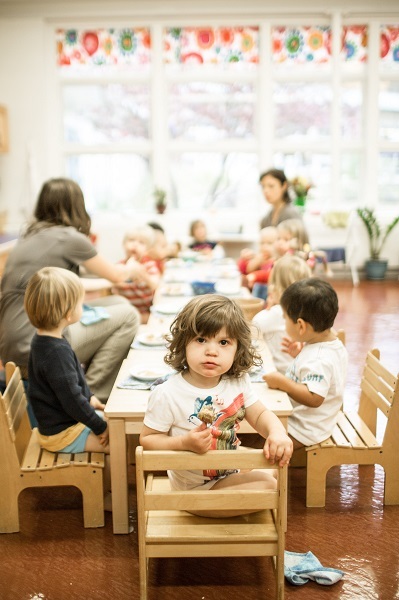 “In many ways, Montessori partnered with me as a parent and as a mother. Incredible gift of the faculty as not only my children’s teachers, but mine as well. Three of our grandchildren have attended two different Montessori schools. I have watched their progress from the sidelines over a period of ten years, and it has transformed me into a genuine Montessori fan. At first I was quite skeptical about the system, but no longer. We have nine other grandchildren and they are all good students, but I sometimes wonder if even they might have benefited from a Montessori Experience…… Why?? As I see it, it’s a system that seems to work with children from a variety of backgrounds; a system which not only focuses on learning, but also on living. The approach to the basic intellectual skills is innovative and solid. But there is also an obvious emphasis on social development, responsibility, independence and artistic sensitivity. Not just learning to read, but wanting to read. Not just learning, but wanting to learn. The system seems to be tuned in to maximizing the individual student’s opportunity for self-development. I have watched this happen and continue when our grandchildren have left Montessori and moved on.